The efficiency of a probabilistic hydrological forecasting system with weather radar and the Probability distributed hydrological model (PDM) was evaluated at the Brue catchment; south-western England. The ability of the radar to measure gauged precipitation in 2007 (regarded as the ground truth) was evaluated using Normalized Bias (NB) and Normalized Error (NE) statistics as the objective function of evaluation. The radar overestimated precipitation measurements by average gauges with NB value of 0.41 and a considerably low NE of 0.68. Furthermore, the effectiveness of a Deterministic nowcasting system (DNS) to forecast radar measured precipitation at 132 forecast time series of 6hrs forecast lead time was assessed. The DNS overestimated the radar measured precipitation with a NB value of 87% and recorded an accumulated NE of 146%. Moreover, the efficiencies of 10 ensemble precipitation forecats generated from a Stochastic nowcasting system (SNS) over the singular deterministic forecasts from the DNS was evaluated at 3 major hydrological events. Some of the ensembles significantly performed better than the deterministic forecast and brilliantly captured the radar measured precipitation at most of the forecast time series. Furthermore, the efficiencies of these sources of precipitation measurement to simulate flows with the PDM at the Brue catchment were also assessed by integrating the radar-based forecasts with measurements from average gauges. The PDM performed satisfactorily well in simulating the flows of 17th January 2007 with an average Nash–Sutcliffe Efficiency Index (NSE) of 0.65 and the model was judged insensitive to the significantly high precipitation inputs for the hydrological event of 27th of May 2007. However, the PDM performed poorly in simulating flows for the historical storms of 20th of July 2007; with the model under estimating flows with bias value of over 250 cumecs for an event popular for its devastating flooding in the Southwest of England. The model inadequacies was however associated to poor radar precipitation measurements and forecasts on which flow simulation was based. 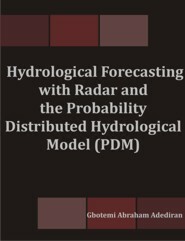 This work therefore emphasis the need for developments in hydrological modeling as well as advancement in weather radar technology to effectively correct radar errors due to radar calibration, signal attenuation, clutter and anomalous propagation, vertical variation of reflectivity, range effects, Z-R relationships, variations of drop size distributions, vertical air motions, beam overshooting the shallow precipitation and sampling issues, that has been identified to affect radar measurements. Mr. Adediran holds a first class degree in Soil Science from the Federal University of Technology, Yola in Nigeria and a Master’s degree with distinctions from the University of Bristol, UK. He was awarded a PhD in Geology and Geophysics by the University of Edinburgh in the UK in 2015. He is a lecturer in Soil, Water and Environmental Sciences.